I have a page on my site with some of my favorite new sites that are showing up on the web. These are not my sites, but they are the kinds of things that I like in a website. There are different reasons that I picked these sites, they all look good, and are clear and easy to use. They don’t use Flash at all or use it only when necessary and never for navigation. The graphics are good, but not overpowering. Sometimes I just like a picture or the name. Some of them are not in english and I still know what they are about. 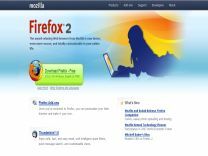 The newest one is called Mozilla Firefox. The page is cool, clean and easy to navigate with plenty of whitespace. It’s very easy on the eyes, not to mention that it’s a great product. It’s been my browser of choice for quite a while now. Firefox is an open source browser that is more secure that almost any other. It works well , is very easy to use and comes with additional plugins to meet any of your needs.